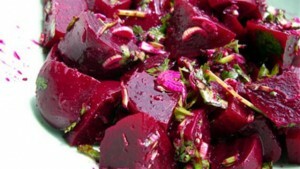 Beetroot Salad With Orange Dressing recipe by Nazia Nazar at DesiRecipes.com. When cool, peel and dice them into half inch cubes. Mix orange juice, oil, salt , pepper, mustard powder and orange rind in a bowl and whisk till the mixture is homogeneous. Pour the dressing over the beetroot pieces and garnish with rings of spring onion .